House of Bourbon: Whaz up! We've been busy. I'm pulling my hair out trying to figure out when to do things. I cancelled a field trip tomorrow. We've already been to the place before and we have to go grocery shopping, or we'll run out of food. Well, we'll run out of everything but banana muffins and waffles. I made 6 dozen banana muffins and 4 dozen waffles Saturday. As a result, we're well stocked on those things. Unfortunately, we're out of flour. We also don't have any meat, milk, bread, cereal, butter... As Dominic would say, "We need to do a major grocery trip." The boys and I started Taekwondo last week. We had two private lessons last week. Then, we started group classes Monday. The boys are having a blast. I can barely walk. But, I am having a blast, too. Dominic is in a class with a bunch of other 4 and 5-year-olds. They are all pretty goofy before and after class. Dominic is enjoying being part of a group. Xavier and Gabriel's group is more spread out, age wise. They're from 6-11. It's mostly 8 and 9-year-olds. Gabriel is, by far, the tallest in that class. I'm glad, though, that they put him in the childrens' class. He's not especially coordinated and I think the adult class would move too fast for him. I'm almost done with my Christmas shopping. I've ordered all the presents. I did most of my shopping online. Now, all I have to do is wait for them to come in, wrap them, and mail them back out. Plus, I need to buy stocking stuffers. I'll do that while I'm out, though. We met another mom and her daughters at the mall today and swapped kids for Mom Christmas shopping. That worked out well, I think. We also got our picture taken with Santa. Aren't they handsome? Those suits look amazing. I bought Gabriel's in September. Of course, the pants are about an inch too short, now. Ugh! He is growing like a weed, and most of his height is coming from his legs. I just wish he would wait until summer to have another growth spurt. It is very funny to see him in some of his shorts, though. They're just huge around the leg because he is so skinny. He looks good, though, doesn't he? He's growing into quite the young man. Gabriel is hoping to start babysitting soon. However, he'll have to wait until his brain can catch up to his actions before he can start babysitting. What part of "Don't open the door" don't you understand? I was getting dressed the other day when the FedEx guy came. I told Gabriel to tell him just a minute, but not to open the door. So, Gabriel tells him, "Just a minute." Then, forgets the guy is out there and opens the door to let the cat out. Okay. He'll definitely be taking a Red Cross Babysitting course before he starts babysitting, anyway. I had planned on it, and this just confirms it. Exciting. He can't wait. I can't wait. What a great Christmas picture with Santa. I think we are going to wait until next year to try to get Madison to sit on Santa's lap!! Merry Christmas! We've got 11 years of pictures. 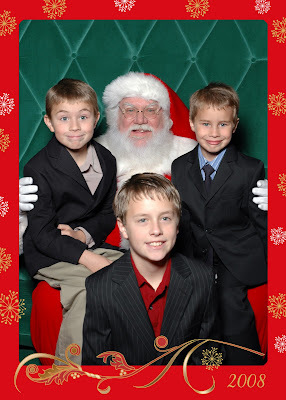 One year, I sat on Santa's lap with Xavier on my lap (he was 2) and another year, Gary sat in the chair, I stood beside it, the boys arranged themselves around him and Santa sat on a little stool in front of Gary. We do have one where Xavier is scowling at the camera and Dominic is screaming his head off, while Gabriel is smiling like the cat that just ate the cream. I'll have to see if I can find all of our pictures and post them. Some of them are really funny.